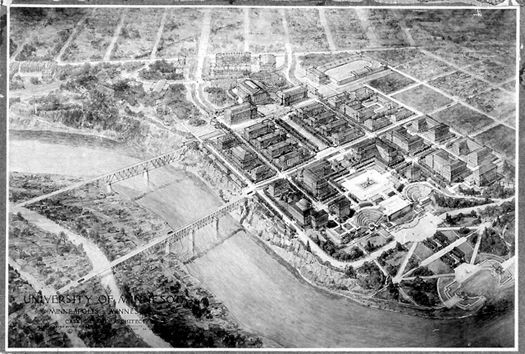 St. Paul architects designed most of the early buildings on the University of Minnesota campus, perhaps because they had better access to the legislature in the Capital city, but Gilbert did not design any early buildings for the university. In 1900, he sought the commission for the Anatomical Buildings but Reed & Stem won the commission. The building did not last long, burning in 1908. Gilbert’s first campus plan was for the St. Paul Seminary, now affiliated with St. Thomas University, in 1893. During the project, Gilbert’s ideas clashed with those of James J. Hill, the seminary donor. Then in 1899, he entered the competition to design the campus of Washington University in St. Louis. He lost the competition to Cope & Stewardson, but that competition helped open for him a new career path in campus and city planning. He was a member of the site committee for the Louisiana Purchase Exposition, and over the following decades, he would design and build campuses for Oberlin College and the University of Texas. He also participated with Frederick Law Olmstead, Jr. in designing a city plan for New Haven, Connecticut. Later Gilbert, on his own, proposed a city plan for Waterbury, Connecticut. In 1907, Gilbert was invited to consult on a design for the University of Minnesota campus. The invitation evolved into a competition, which he entered (not obligingly) and won in 1908. Winning the competition, Gilbert won a headache from butting heads with Clarence Johnston. Johnston had been appointed state architect in 1901, and he believed that it was his job to design the individual buildings on campus. Gilbert believed that as the winner of the competition to design the campus, he should be allowed to design the buildings. It was a messy skirmish. Johnston accused Gilbert of trying to steal his client (an accusation Johnston had made in 1882 when the two men were negotiating for Gilbert to take over Johnston's practice while Johnston traveled to Europe). Gilbert asked Johnston about the fees he charged. When Johnston revealed the numbers to Gilbert (based on a sliding scale but below those of the American Institute of Architect's schedule), Gilbert replied that Johnston had nothing to fear, for he would not work for such a small fee. [CG to Office, June 28,1909, Box: 4, Fldr. : 33, MNHS-CGP.] The compromise to which Gilbert surprisingly agreed called for Gilbert to design the campus and Johnston to design the buildings according to Gilbert's plan. Gilbert's design for the University of Minnesota campus is so important as to deserve a book in itself. His sources for the ground-breaking mall design are often stated as the University of Virginia designed by Thomas Jefferson, and the campus of Columbia University designed by McKim, Mead & White. The original campus, which survives north of Northrop Auditorium, is an arc of unrelated buildings in a park-like setting facing University Avenue. The land to the south, now occupied by the north end of the existing mall, was divided by railroad tracks and developed with farm school buildings. Gilbert's plan recognized that the existing campus plan could not be expanded in the same manner, that the railroad tracks and farm school could be moved, but that Washington Avenue could not be moved. His plan called for the mall to step down the hill to the river. It was a bold plan of genius that served the university well until its architectural discipline collapsed in the 1970's. There is a rising enthusiasm for preservation of the Gilbert portions of the campus and an effort is being made to connect the mall to the river.